CV Graphics and Printing Presentation Folders can offer the culmination of the majority of our technical capabilities for one low price. CV Graphcis invests in large quantities of heavy-bond folders of all color choices to offer unbeatable base prices. 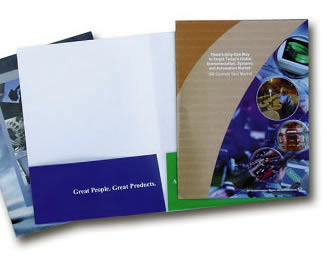 Our presentation folders are most often combined with other products, such as sell sheets, so our clients can benefit from incorporating several cutting edge technologies together for one low price that is guaranteed to impress!